With the IoT evolving, will we start to see over-engineered solutions to problem that don't really exist? We take a look at one such possible scenario. As the Internet of Things evolves, it seems that an ever growing number of devices are connected to the Internet. Many of these are incredibly useful, but I do wonder if we’re running the risk of attaching IoT to an item and expecting it to fly on the back of the hype surrounding it. An example of this is the smart keyboard developed by Das. The device uses an array of LEDs underneath the keys to try and help us to work more efficiently. 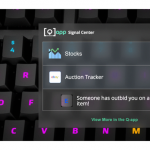 The product, which has reached its funding target on KickStarter with ample time to spare, allows users to program their keyboard to do various things at various times. For instance, a particular key might flash when you receive an important email from your boss, or another key might flash if you get an alert on Facebook. The smart functionality of the device comes via the Q App, which comes with a number of pre-programed alerts to track certain things, whether it’s a notification on Twitter or an email from work. The belief is that by plugging these things into the keyboard, it frees us up to work in a more productive way. Whilst Das Keyboards have a certain pedigree in the industry, I can’t help but wondering if this isn’t a prime example of over-engineering a solution to a problem people don’t really have.